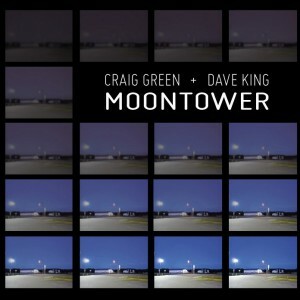 The second release from two of the most fearless and creative improvisers on the planet, guitarist Craig Green and drummer Dave King. Moontower is not so much an object or fixed location as it is a state mind or stream of consciousness channeled from the energy that these two sonic sculptors posses. Recorded and mixed over two days at the vintage audio temple, The Hideout which is nestled along the Mississippi River in King’s hometown of Minneapolis. Coincidentally, Green is from the opposite end of the river, born in New Orleans. Both musicians, set-up in one large space, surround by classic organs, amps and electronics must have looked like they were about to perform the latest Ennio Morriconi score to a 50’s sci-fi film. Sonically that may not be too far from the truth. Both Green and King have a love and pull toward a modern aesthetic. Not always the sharp and angular kind that shocks the listener into submission, but the variety that invites you in, shows you the way then offers you a unique and wildly different path to the future. Like a classic Eames chair, the past, present and future all in the same moment happen. This is dark and moody music, like a night time soundtrack to a desert landscape, where “blue” and “black” and the light of the moon surround you. These are sounds that will haunt your imagination and will get inside you like a cold chill when you walk out into the great wide spaces on silent nights.